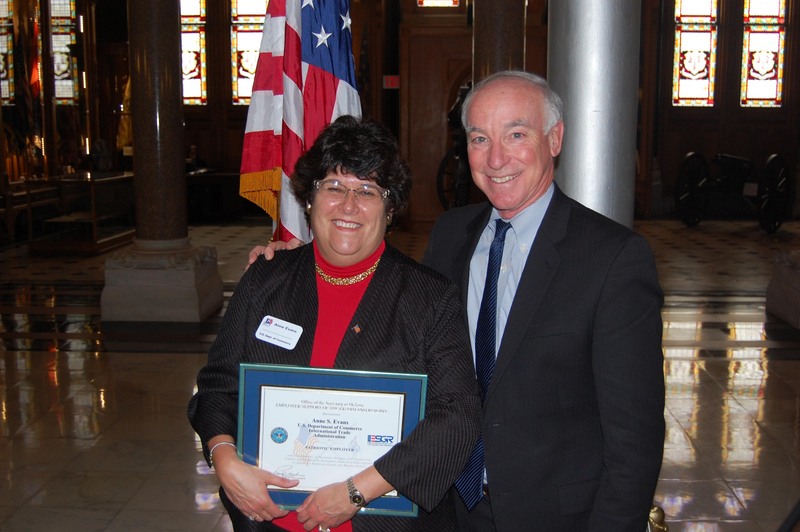 Anne Evans and Rep. Joe Courtney (D-CT) pose after Evans was awarded the Department of Defense Reservist and Guard Patriot Award. If Anne Evans’ 2009 appointment had begun on time, 22 Connecticut veterans might have never had the opportunity to learn about business. That receptionist’s husband was a 20-year veteran of the U.S. Navy. After retiring from service, he had trouble finding a job because potential employers felt he had no business experience. Knowing something about the Connecticut business community after years of working in international trade, Evans saw an opportunity to help. She approached leaders in Middletown and throughout the state. She worked with colleges to find student veterans interested in learning about business. Through the Connecticut Department of Labor’s Transition Assistance Program, she brought on her first veteran for an unpaid internship in 2009. Then in 2010, she was able to secure funding for a paid internship in her office. Since 2009, Evans has brought in a total of 22 student veterans as interns. Her work recently earned her the Department of Defense Reservist and Guard Patriot Award, which recognizes workplace supervisors who have gone out of their way to support members of the military reserves. There are currently four veterans in her office as part of the program, helping Connecticut businesses increase their exports. The team in place now is reimbursed through a number of state programs. Also on Evans’ full-time staff is Coast Guard veteran Anthony Sargis, who earned the first paid internship in the Middletown USEAC in 2010. Evans is proud to point out that every veteran who has interned in her office has gone on to find employment.